After Ken Levine announced the “winding down” of Irrational Games, much of the staff was forced to seek out new jobs. As we’ve seen earlier this week, some teamed up to create Day for Night Games. That developer is currently Kickstarting The Black Glove. Now we see that another bunch of talented former Irrational Games’ (also Harmonix, Bungie) team members formed The Molasses Flood. 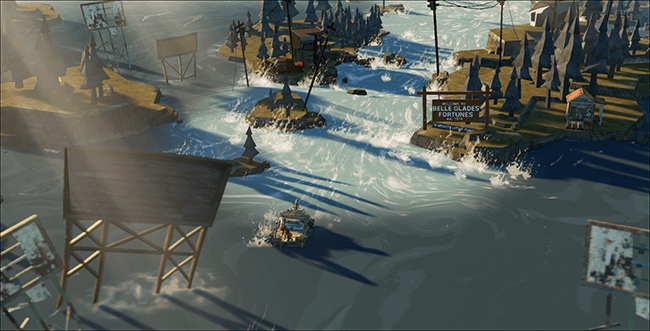 Their team has also arrived on Kickstarter this week to fund The Flame in the Flood. The Flame in the Flood focuses on a woman named Scout and her dog Aesop as they journey to the end of a river in post-societal America. As she explores, many problems will need to be overcome such as finding food, staying dry and healthy, and avoiding dangerous animals. It’s also a rogue-lite which means there are some roguelike features included, although not to the extreme. As such, the river you travel will be procedurally generated and dying makes the game start over. In order to keep the experience from being too rough, river generation is “pseudo” random, which means there are some rules in place to always create a good mix of gameplay. Deaths are also made a bit gentler by Aesop bringing back any backpack items that you had before dying. Survival games are definitely in vogue lately but The Flame in the Flood appears to have enough unique about it to be a success. Right now the game is only targeting a Windows and Mac launch, so sorry to any console hopefuls out there. The team’s asking for $150,000 and early backers can nab a downloadable copy for $15 ($20 after all slots are filled). 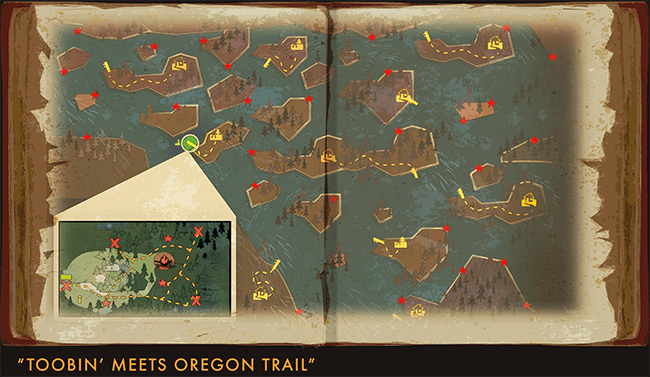 Track the progress of the Flame in the Flood Kickstarter by heading over to our Campaign Calendar.